The idea for this week’s post came from a conversation I had with a student during a library instruction session. This student wanted to know if the library provided online instructions for navigating the library’s mobile page and mobile database interfaces. My answer was “Well, no, not specifically… But many of concepts and principles presented in our other help guides should still apply.” The student seemed satisfied with that answer, but I continue to wonder: how can we provide the same type of point-of-need instruction documents (PDFs, videos, etc.) to mobile users? Or even, should we be providing this type of support? Long-time readers probably know Library Tech Talk authors have a great interest in mobile devices. We introduced why we thought mobile technology would become important for libraries, previewed the iPad upon its release, demonstrated how to use jQuery Mobile for making mobile websites, and show you tools that use mobile devices to engage library users in reference and instruction. But so far, we haven’t talked about providing instructional support for these devices. As more of our students rely more on smart phones, tablets, etc. to view, consume, and create information – with the ECAR reporting that the number of students using smartphones for academic purposes has nearly doubled since 2011 – academic libraries are pushed to not only provide mobile versions of their resources, but also to help people navigate those resources. While I am still investigating more systematic responses to this question, I’ve found a couple of interesting tricks and tools, particularly for creating screen captures. Many library help guides include screenshots to demonstrate step-by-step instructions for using a resource, and since mobile sites frequently look different than our full sites, images for mobile instruction should reflect this. But do you know how to take a screenshot on your favorite mobile device? The actual method varies by device and operating system. For instance, with Apple devices (iPad, iPhone, iPod Touch, etc. ), simply pressing the “home” and the “power” keys simultaneously will take a screenshot of whatever you’re currently viewing and save it to your pictures. 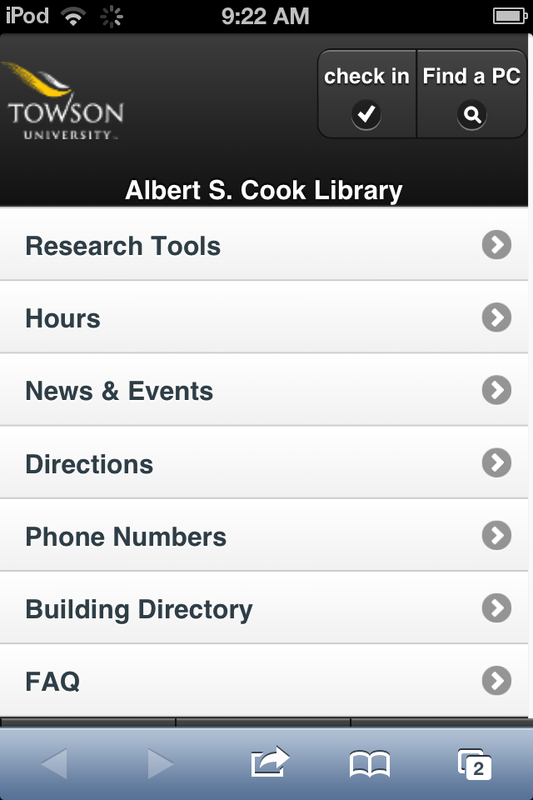 Towson University Cook Library’s mobile site, taken with an iPod touch. Not an Apple user? There is also be quite a bit of information floating around the internet to guide you through taking a screenshot on your other devices (including the Kindle Fire and Android devices). In addition to taking the actual screenshot, there are applications specifically designed for you to use the mobile device to annotate and edit screenshots, rather than switching over to image editing on a personal computer. One such free app is Evernote’s Skitch. With versions available for iOS, Mac, and Android, Skitch allows you to do basic mark-up of photos, screenshots, and maps using your mobile device. You can use annotation tools like text, arrows, and shapes to call out or highlight important parts of the image. Additionally, freehand drawing tools allow for more creative highlighting and drawing on the image. There’s even a pixelation tool allows you to blur out sensitive information (like an account number or library log on information). You can then email your completed images to be saved or, if you’re an Evernote user, you can save them to a specific notebook in your Evernote account. The images below were created using Skitch on my iPod touch as examples of demonstrating important features of mobile database. Using Skitch to demonstrate the library’s mobile site. Annotated screenshot demonstrating keyword searching in a mobile database. 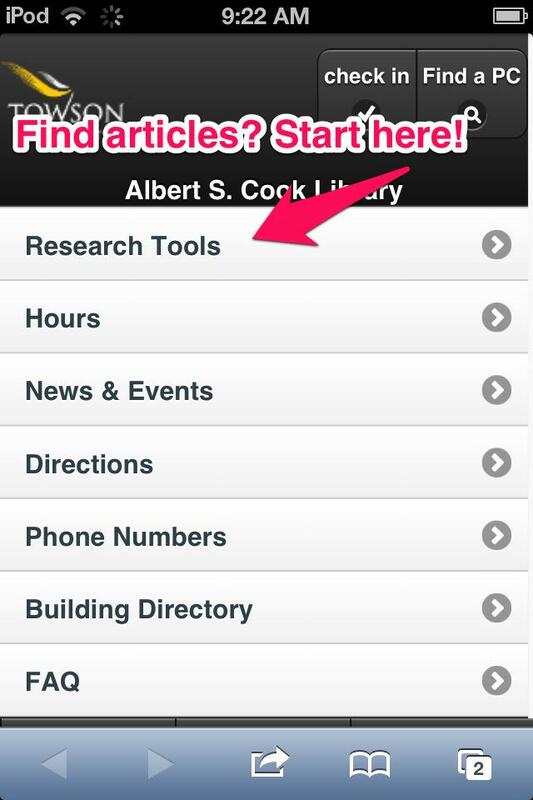 Using “Find it” to locate articles in the mobile database. While screenshots and annotations are the building blocks to providing help to our mobile users, a question I have yet to satisfactorily answer is: how do we deliver this content? Many of our library’s help guides are PDF documents, which are not necessarily easily viewed on smaller mobile screens. Creating videos and screencasts is another option, and currently our library’s mobile site links to our YouTube channels for video help guides. However, what tools are available to help us to create these videos showcasing the mobile interface itself? And are videos the best solution? Or should we focus on delivering the content on a webpages, taking a responsive design approach? As I continue to explore this line of questioning, I’d love to hear from our readers about projects you’ve heard of or what your library is doing to address this potential need! New post on Library Tech Talk! Lots of interesting ideas in this post.